We're still (always!) looking for extra room fantasies – but now we're looking for field recordings, as well... field recordings by phone. So if you're anywhere that seems sonically interesting over the next few weeks – a waterfall, a migratory bird preserve, a shuddering freight elevator, the Cornish coast, a screeching Red Line train, the International Space Station, a secret meeting between Bush and Ahmadinejad – feel free to give us a ring: +1 (206) 337-1474. You'll be connected to a voicemail account where you can simply hold your phone up high – and proud – and record whatever it is that you're listening to. Meanwhile, feel free either to leave a brief explanation of what it is we're hearing, or even call back and explain what sounds you've left for us to sort through. And then the best of the best will be played live on the radio in New York City – and podcast round the world – via DJ /rupture's weekly radio show on the incomparable WFMU, 91.1 FM. 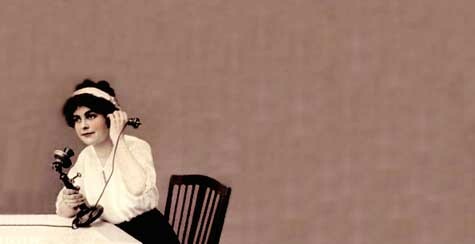 The basic idea, if you're curious, is to open up the artistic possibilities of field recordings to anyone with a telephone – whether that's a mobile phone, a public phone, or even a phone attached to the wall in your kitchen. 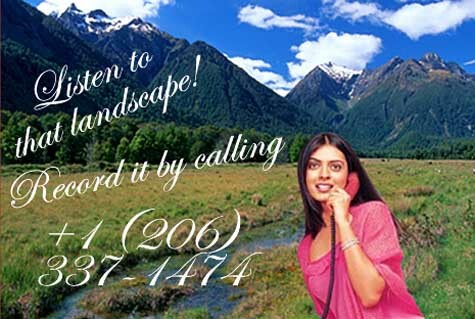 The results should prove that you can acoustically experience a landscape through the telephone. Tele-scapes. As it is, mobile phones in particular present us with an untapped microphonic resource; these roving recorders encounter different environmental soundscapes everyday – the insides of lobbies and elevators, cars stuck in traffic, windy beaches – yet we're so busy using them for conversation that we overlook (overhear?) their true sonic possibilities. The telephonic future of environmental sound art is thus all but limitless – and putting some of that on the radio is just fun. (For a tiny bit more info, click here). I wrote to you a couple of months ago on the postopolis wall about the possibilty of you taking part in the student-run lecture series at Edinburgh University. It's great to hear that you're interested! Lectures are open to students, professionals and the general public. Over the last few years we have hosted the likes of Peter Salter, Smout+Allen, Ben Nicholson, Daniel Libeskind, Bolles Wilson and many others. The lectures are informal and generally last an hour or so, often followed by a trip to the pub. They take place weekly at 6pm throughout the academic year. You said you were in London in 2008 so we'd love to see you then if you can. If you are interested in giving a lecture please let us know which date would suit you best. We will provide expenses including travel, accommodation for one night and a meal, all of which we would organise on your behalf. Brilliant idea! I've passed this on to all our readers at Champions of Sound so hopefully they'll call in with some great sounds. We had some great fun playing around with soundscape recordings at my office a few years ago. In trying to get a better sense of the realism (or lack thereof) from computer-modeled acoustics of performance spaces, we went out and capture a number of binaural recordings of train stations, stores, people's houses, etc. then played them in succession with the performance space sounds. The "believability" of the sound greatly increased if we also had a photo of the recorded space displayed on a screen. So... it's too bad that you won't also have photos on the radio show but maybe you could solicit cell phone pictures to go along with the recordings if you post the results online somewhere, too? I agree with Greg, a picture would be nice. Is this number a cell? Then we could just send a pic before/after the recording. Sarah - I sent you an email the other day; let me know if you got it. Tyler, Greg - The phone number here just goes to a free voicemail account - not a cell phone. But you can always email a JPG to me at "bldgblog" via gmail, just for kicks. Otherwise, this is sound-only... But illustrations are a nice idea. Seems quite cool, but I recommended he contact you directly about allowing you to use his audio file. I am assuming that they must be pretty bad at capturing sound which is distant from the handset. Interesting idea, but im not sure its going to change "things" greatly. Much of the sounds that we hear subconsciously as we go through our day are probably so far off a cell phone mike's radius that it cant get picked up. I am prepared to be surprised.